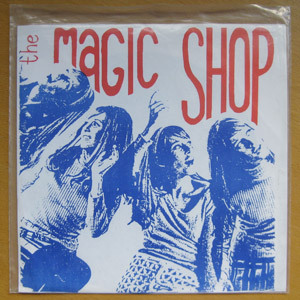 A flexible slice of indie-pop history, this – the Sha-La-La label was the precursor to Sarah Records; they released a number of flexidiscs that were generally sold with fanzines. They all had fantastically evocative, two-colour wraparound sleeves, which tended to use imagery that was much the style of the time (and the genre): 1960s/1970s-esque pictures of, mostly, groovy-looking women. I imagine that many a set of 60s fashion magazines, along with old Jacky or Blue Peter annuals, were plundered to provide imagery for records and fanzines of the time. I’ve said that this flexi is a 7″ – it’s actually not quite that wide; it seems to be more like 5.5″. Flexis seem to be a bit more flexible (pun intended) in terms of their size. I’ve seen them at a variety of sizes, from around 4″ up to 11″. However, I haven’t seen a new one for a good number of years now – I wonder if anywhere still manufactures them? In the early 1990s, my friend Rob and I had a plan to start a record label which was to be named Autumn Records. It never happened, but I got as far as investigating the costs of flexi manufacturing – even back then, I only remember there being one or two places in the whole of the UK that would do the job. Happy times, though – I remember that you could supply the music to the flexi manufacturer on cassette tape! None of your super-fancy high-bit-rate mastered-for-vinyl sound files required. The back of this record’s sleeve (which features The Visitors’ cover – each band got one side of the sleeve) includes contact details for The Visitors: Stuart, Moorcourt Close, Sidmouth. (I’ve cut a bit out of the address – can’t be given out a full address on the internet, can I?) Now, with the magic of Google Street View, I can have a virtual wander around that street – and so can you. Looks quite nice, doesn’t it? I wonder if Stuart from The Visitors still lives there?